Le Currituck Carl’s est une belle maison de vacances nichée dans le quartier paisible de Magnolia Bay du Currituck Club. 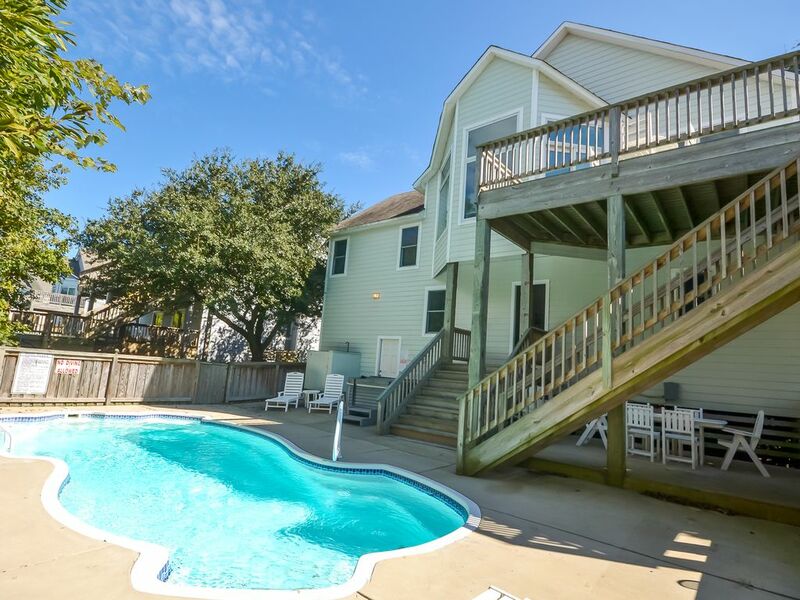 Ce soundside home a tout ce dont vous avez besoin pour passer de super vacances sur les Outer Banks. Internet haut débit sans fil gratuit, appels longue distance gratuits aux États-Unis, télévisions à écran plat, grande piscine privée et bain à remous dans la zone du pont arrière. Équipements à gogo dans cette maison de vacances abordable. Parfait escapade de golf été, printemps ou automne! Les installations comprennent une piscine privée de 14 'x 32', des piscines communautaires, des réductions pour le golf, un bain à remous (disponible de la mi-mai à octobre), un bain à remous en maître, 4 téléviseurs HDTV, 2 combos DVD / magnétoscope, une chaîne stéréo avec lecteur CD, accès Internet sans fil, chaise haute, Keurig, douche extérieure, barbecue au charbon. Chaînes Haute Définition! De nombreux appareils de cuisine ont été mis à jour en 2017. Parking 3-4 voitures. Interdit de fumer. Les animaux ne sont pas acceptés. Lors de votre séjour au Currituck Carl’s, vous avez un accès direct à toutes les commodités du club Currituck, notamment le golf, le tennis, le club de remise en forme, le basketball, le volleyball, le jeu de boules, les piscines et fêtes communautaires, et des kilomètres de pistes cyclables et de sentiers pédestres. De plus, les clients ici bénéficient de tarifs réduits sur les green-fees du golf ainsi que de la possibilité de réserver les départs au plus tard un an à l'avance. La plage est à quelques pas ou vous pouvez prendre le tram gratuit. Tous les chariots vont du samedi du week-end du Memorial Day à la fête du Travail. Les autres attractions à proximité incluent restaurants, boutiques, plage et plage de chevaux sauvages 4 x 4, le phare de Currituck et plus encore. Faites-en votre destination pour des vacances vraiment mémorables. Ces tarifs s’appliquent aux particuliers qui louent la maison d’un membre du Currituck Club Golf ou aux invités de membres qui ne sont pas accompagnés par un membre. Tous les tarifs sont sujets à changement sans préavis. Tous les tarifs incluent le panier, le green fee et les taxes. Lits: 1 King, 1 Queen, 2 Twins (on a un lit gigogne). Tous les draps sont fournis et les lits sont faits avant votre arrivée. Rez-de-chaussée: chambre à coucher avec lit Queen, chambre à coucher avec 2 lits jumeaux et gigogne, salle de bain complète, accès au garage. Demi niveau: King Master Bedroom. Niveau supérieur: salon, cuisine, salle à manger, salle d'eau, accès au solarium. Thank you for taking the time to provide us feedback regarding your recent stay at "Currituck Carl's" We are thrilled to hear that you enjoyed your time spent here on the Outer Banks! It truly sucked. As a college graduated, I Paid $3,000 for a week in this private neighborhood house on the sound side which had no air conditioning. Called immediately to get it fixed, I was polite, understanding that stuff happens, spent our days outside in that heat. Going to sleep in 82 degrees is not ideal. No one came out, management was ignoring our phone calls (which we called 2-3 times a day), and when we went into the rental building to talk to someone, they beat around the bush. The problem didn&#x2019;t get fixed until we left which was a day early. I will never rent from you guys again. I&#x2019;ve been a loyal returning customer year after year.. I&#x2019;m fed up. THAT WAS RIDICULOUS! And for my troubles only giving back $200? It should&#x2019;ve been half. I paid for a week for a house in a nice neighborhood which should&#x2019;ve had air conditioning. You should be appalled by this. We had a great stay! The trolley is definitely nice as it is a little bit of a walk to the beach. Loved the pool, great for kids! Thank you so much for your review! We are so glad you enjoyed your vacation. We really hope to see you again soon! This was my families first trip ever to the beach, and it was absolutely fantastic. The location of Currituck Carl’s was perfect for us – very easy to drive to the beach or use the trolley, and an excellent location for shopping, coffee shops, ice cream, restaurants and groceries. Currituck Club was very easy to navigate around, and I appreciated the gated community. The house was an excellent choice for us – the layout with four teenagers was great, everyone was able to have their own space as needed, and come together for family time. My beloved and I were able to start our day on the deck with coffee – you can just see the Sound over the trees. The pool and hot tub were very good – the shade around the pool was especially appreciated by the fair red heads in our group! I was pleasantly surprised at how well stocked the kitchen was, as we did the majority of the cooking in the home, and it was very nice to have so many utensils and such – having both a Keurig and a drip pot, plus the ability to use a Crock Pot or a blender was great! The coffee table was just the right size for a puzzle, and we did enjoy the movie selection in the home. We had no major issues come up during our stay, the pool and hot tub did not appear to be serviced while we were there, and there was conflicting information about what days trash and recycling pick up were, but really not a big deal. The house itself was very clean and very well maintained, a few nicks and bumps here and there, but nothing crazy. Just a very dear sweet house that was an amazing backdrop for the fabulous memories we made. We definitely recommend it and would love to stay here again someday. Thanks for taking the time to share your experience with us! We agree that Currituck Carl's is a fabulous home! The homeowners take great pride in their home. We are happy that you had a wonderful vacation, and we can't wait to have you back in 2019! I was exceptionally pleased with the secure community the property was in. The special accommodations that come with the gated community are a bonus. The house was well cared for and had everything you need. The layout of the house is nice if you have older kids due to the rooms being spaced nicely. The pool and hot tub were fabulous. Maintenance for the property was extremely attentive when it came to keeping the pool and hot tub clean. It was fabulous and would recommend this property. Our priority at Kitty Hawk Rentals is to provide top-level customer service, and we strive to ensure a positive guest experience. Thank you for taking the time to give us such wonderful feedback! Overall we really enjoyed our stay. We appreciated the VHS (yes, really) tape collection! John, we are so glad that you enjoyed your stay! We hope to see you again soon!